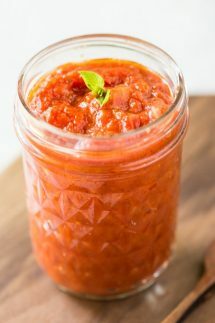 My Keto Low Carb Marinara Sauce is so easy to make, you’ll never want to buy store bought again! You can change up the herbs in it, and if you like to keep it authentic you can add a little pinch of red pepper flakes. The serving size is 1/3 cup and comes in at around 5g net carbs. I used canned tomatoes, you could use fresh peeled tomatoes but I only recommend that if they are in season and taste great. I used a little oregano and basil in my recipe, but you could also use a little thyme or other fresh herbs if you prefer. My kids don’t like red pepper flakes so this time I left them out, but they do add an authentic touch to the recipe. If you find that your low carb marinara sauce has thickened too much, simply add a little water to it and stir. Make sure you saute the onion until it’s soft, this will add plenty flavor to the finished sauce. What is the difference between Marinara Sauce and Spaghetti Sauce? 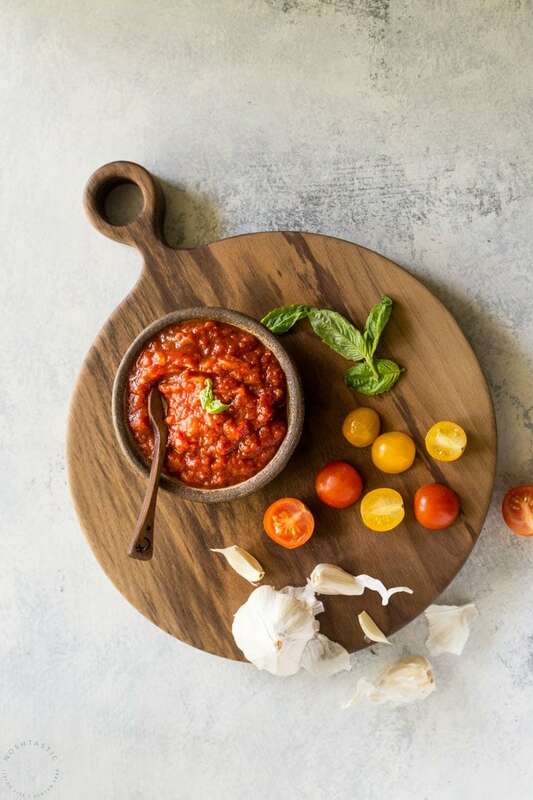 Marinara sauce typically includes tomatoes, garlic, herbs, onions, and garlic, and red pepper flakes, though there are some variations. Spaghetti Sauce is the American version of Bolognese sauce and is similar to Marinara Sauce but it contains ground beef and usually does not have red pepper flakes. Are Marinara sauce and Tomato sauce the same thing? No, marinara sauce and Tomato Sauce are not the same. 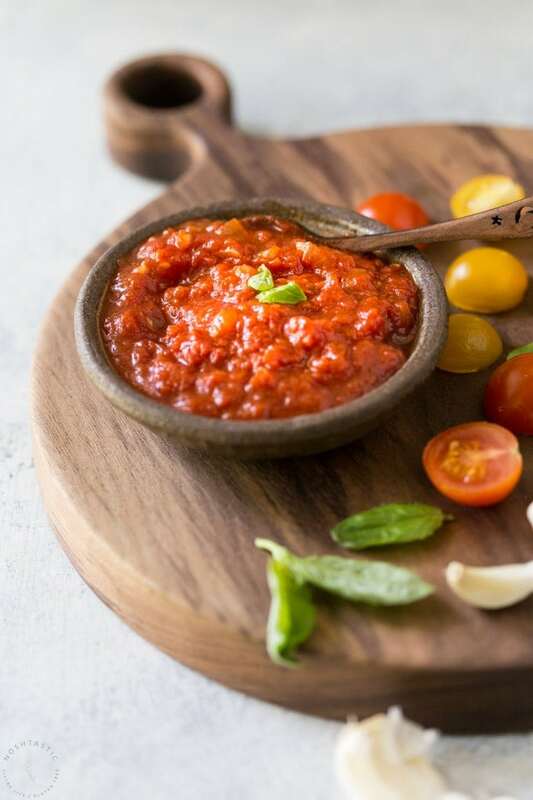 Marinara sauce is made with tomatoes, garlic, herbs, onions, and garlic whereas tomato sauce is seasoned with onion, carrot, celery, and bay leaf, and simmered until thickened and rich in flavor, sometimes with a piece of pork added for flavor. 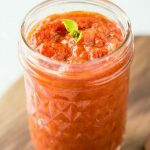 Easy Homemade Keto Low Carb Marinara Sauce that's a fraction of the price of store bought! Add 3 tbsp olive oil to a pan and over a medium heat, then add chopped onions and sauté gently for 5-6 minutes or until soft. Cook on a low to medium heat for 15-20 minutes, or until the sauce has thickened, add more salt to taste if needed. Serving size is about 1/3 cup, with 5g net carbs per serving. 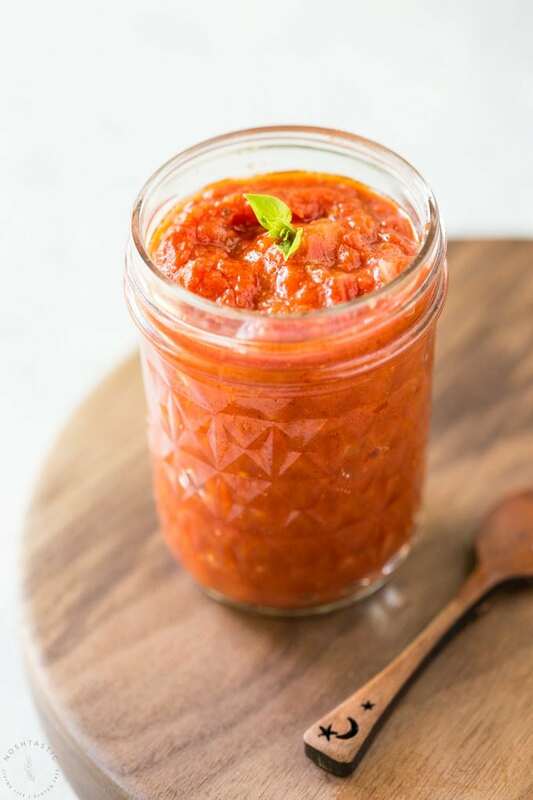 A pinch of red pepper flakes in Marinara Sauce is authentic, but I often omit them depending on what sort of recipe I plan to use the marinara sauce for, it's up to you! Hi, thank you for the recipe!! I was curious how long it will save for in the fridge? or if you can it how long it is good for? Hi Jody! I think it would be good for up to four days in the fridge.